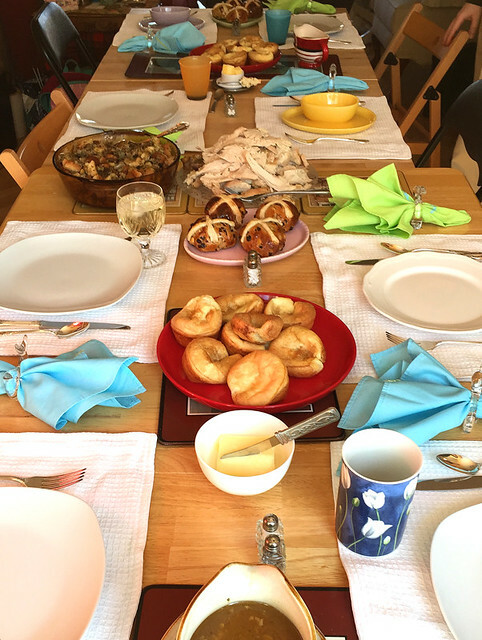 Our family’s Easter celebrations can happen any time over the long weekend, to coordinate with peoples’ schedules. Barring illness (we’ve had a couple of spring bugs work their way through our family over Easter, so those years nobody much cared about chocolate), though, the Easter Bunny visits after the kids go to bed on Easter Eve, so that there are gifts for the children to find first thing on Easter Sunday. In our family, the Easter Bunny hides chocolate eggs around the main level of the house, but Easter baskets are put together by Mom and Dad. Although it may look like a lot of stuff, it’s generally dollar-store or thrift-store finds (except for the Skip-It-like toys this year). The downside is that sometimes the gifts aren’t of the highest quality, like the Crazy Eggs (Eights) deck from the dollar store that was entirely spades… Hmm, manufacturer’s flaw much? The toy I thought was the coolest was the Sew Science kits, which provided the materials and instructions for the kids to make their own sewn circuits that really light up. Super cool! I think the kids were most enthused about the K’Nex kits, though. This year Hubby and I got little Easter baskets as well, although this isn’t always the case. Hubby’s basket was filled with his favourites: Farm Boy fresh jujubes, Twizzlers Nibs, Ferrero Rocher chocolates, and Sweet Tarts. I got a big bag of Whopper Robin Eggs, sock yarn, and a cute Peeps lunch box. Easter afternoon is basically time for everyone to eat chocolate, the kids to play with their new toys, and the adults to prep for dinner. 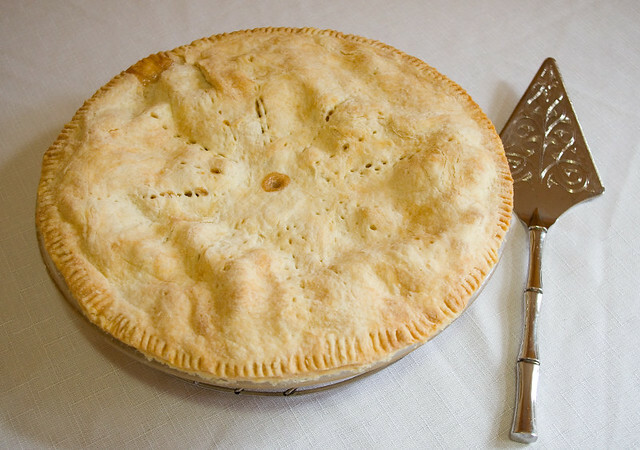 I baked an apple pie using the crust from page 73 of The All-New Purity Cook Book (Elizabeth Driver, 2001), as usual, and the filling from page 678 of the Joy of Cooking (Rombauer & Becker, 2006 edition). 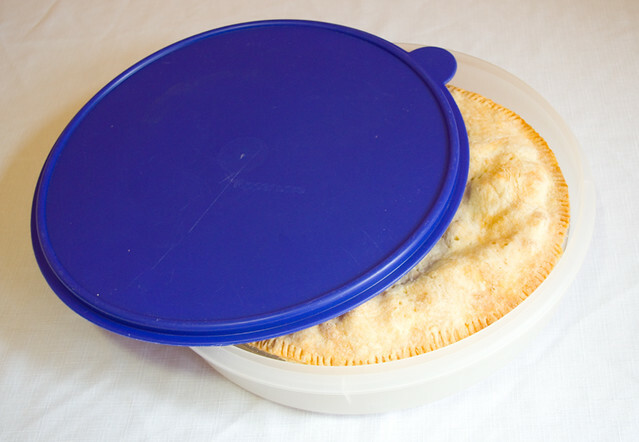 I was actually excited to be able to use my new-to-me Tupperware 12″ Pie Taker for the first time in order to bring the pie to my parents’ place. I was so happy to find this because I usually transport my pies in Ziploc bags, but the top of the bags have a bad habit of getting stuck to the top of the pie. The Tupperware worked much better! 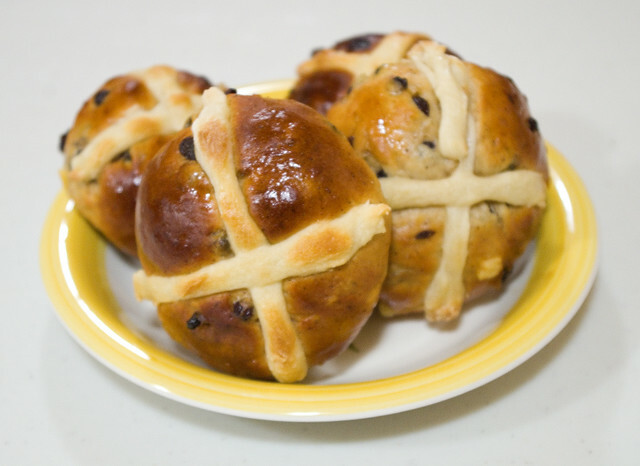 I made hot cross buns again this year (page 37, Baking Bread: Recipes From Around the World for the Complete Home Baker by Audrey Ellison (1995)). I think they turned out much better than last year’s, but I’d forgotten that last year I burned the first batch cooking them at the recommended temperature for the recommended time. I almost made the same mistake again! Luckily, I got them out just in time. I think they should take 12 minutes to bake, max (instead of the recommended 15 to 20 minutes in the book). This year I also used the glaze after baking, and boy was it sweet and sticky! The kids seemed to like it, though. Mom put on her traditional turkey spread for our family of four, my parents, and their good friends Mrs. and Mr. B. (I guess the more traditional roast would be lamb, but Mom doesn’t like it and since she’s the cook, what she says goes. Mom gave us all the choice between pork and turkey, and we chose turkey.) It was delicious! It included roast turkey, stuffing, mashed potatoes, squash casserole with walnuts, Brussels sprouts, gravy, and… Oh, what am I missing? 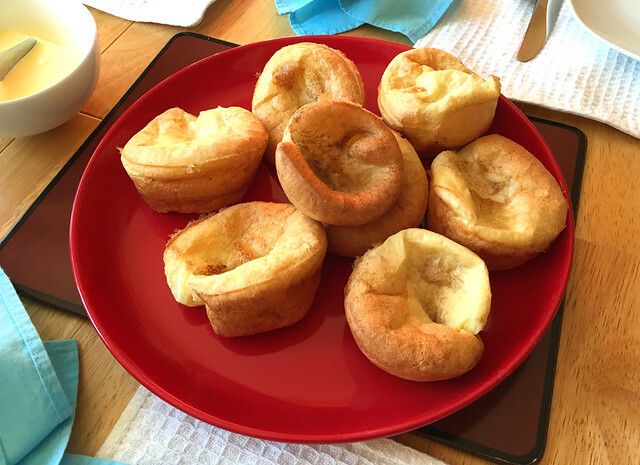 That’s right, everybody’s favourite part: Dad’s famous Yorkshire pudding! Dad only used to make this for roast beef meals, and then he’d only make a single batch. In the last few years we’ve managed to persuade him that any roast meat with gravy needs to be paired with Yorkshire pudding, and that a double batch in the bare minimum quantity. They never, ever go to waste. 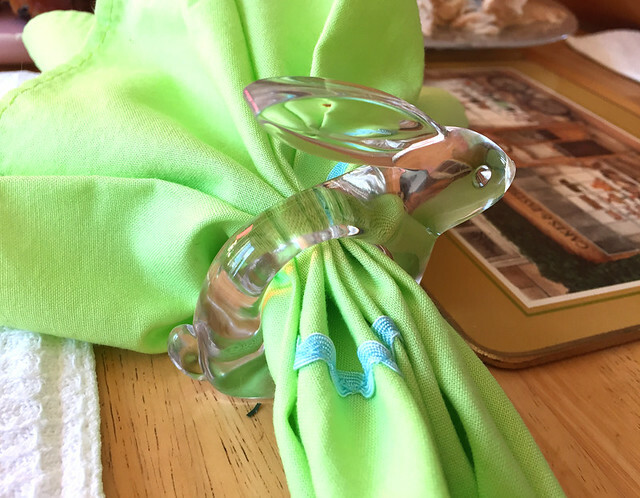 Of course, my mom set the table with seasonally-appropriate cloth napkins and adorable napkin rings. I wanted to say thanks again to Mom and Dad for hosting such a delicious meal! And I hope that you all had a lovely Easter — or, for those who don’t celebrate the holiday, a fantastic long weekend!